Magic Dough Non-Slip Pastry Mat. Magic Dough Non-Slip Pastry Mat is the ideal surface for creating and rolling out your dough works. The top face is totally NON-STICK so there is less of a mess because constant flouring is not necessary. The bottom surface is a special NON-SLIP coating to keep the Magic Dough mat from sliding on your table or work top. The large 18" x 24.5" size provides a huge area on which to roll or hand form. 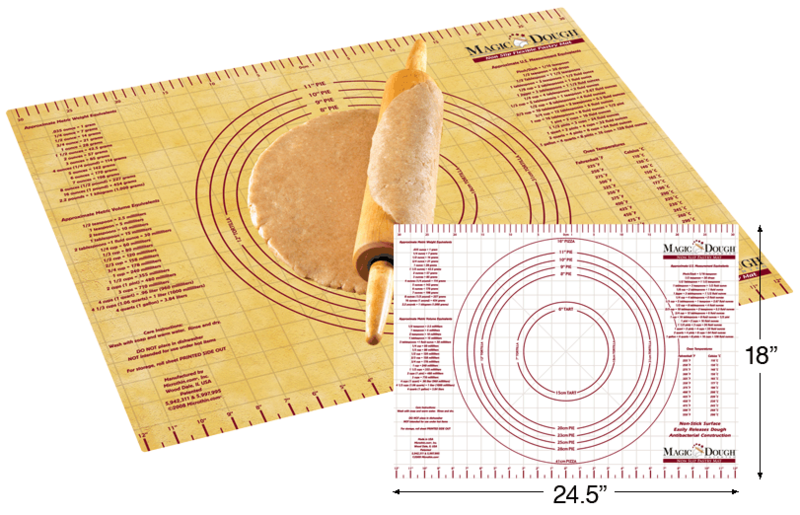 Handy conversion tables are printed right on the Magic Dough Pastry Mat to help you with all sorts of kitchen measurements. And the circle dimensions show you exactly how much dough to work and where to stop so you don't waste the dough. The Magic Dough Non-Slip Pastry Mat washes clean with soap and warm water, and it rolls up to store away easily. It is not meant for cleaning in a dishwasher as the high heat will greatly affect the different materials used in making this special mat. Both top and bottom have tremendous antibacterial properties to prevent from mold, mildew and the spread of other types of germs, keeping your kitchen more healthy in the process. Antibacterial properties using TriclobanTM are built into the plastic to inhibit the growth of bacteria, but may not protect users or others against bacteria. The best way to remove bacteria is with a thorough cleaning.